Ambrosia Bears is more than happy to accept commissions from bear friends! 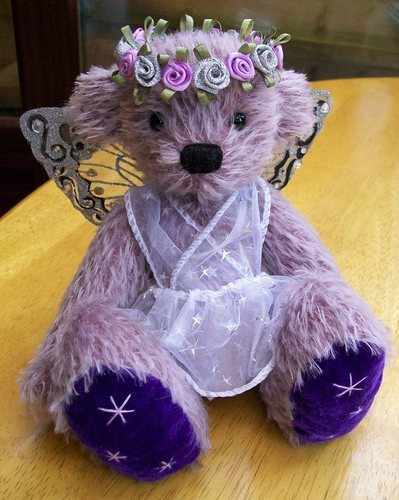 Ambrosia is especially proud to present her first, the beautiful fairy bear, Moonbeam! Moonbeam is made from blackcurrant, sparse, German mohair. She has beautiful wire-framed silver wings, a wreath of silver and purple satin rose on her head, and a sparkly, star-studded organza dress. Moonbeam also has a commissioned sister, Starlight, also shown below! If you have an ideas and would like to see them realized, just let us know, and we will do our very best. Ambrosia also has another friend who has just gone off to her new home; Willow was also a commission and was created using sparse German mohair. Very sweet! 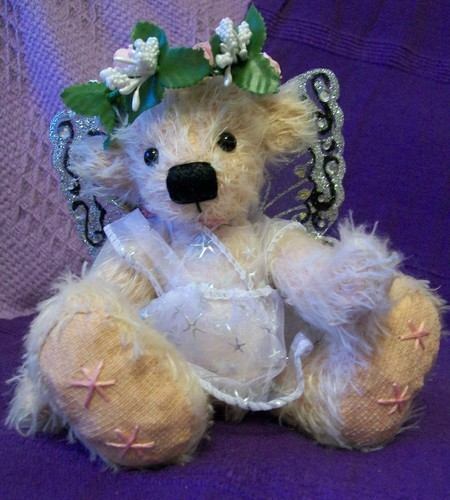 And here is the gorgeous Starlight, also a fairy bear, and a Yule bear as she was created out of the Yule spirit! This Christmas has brought along another couple of real sweetie pies! Natasha wanted a couple of bears for her daughters, and had some fabulous ideas about what she wanted. The candy canes and luggage labels were Natasha's ideas, and don't they look fantastic on little Jemima and Jasmine? Ambrosia is very pleased that the two sisters are staying together, and, even better, are going to a home where Fleur and Chestnut already live; there will be a wonderful Ambrosia Bear reuinion this Christmas at Natasha's house! And Emma loved the bear in the photo in Alice's Bear Shop in Lyme so much, that she asked if a similar bear - but with differences to make it one-of-a-kind - could be made. Here is Misty! And Holly, who has already adopted Brindle, asked for a friend to be made for him. And here is the lovely Autumn; he looks just like a little king! Holly loved Ambrosia Bears so much, that she wanted a little Prince to go with the King, so Ambrosia went out into the Flowery Garden and found Prince Webly! Isn't he sweet? And, shortly afterwards, Sarah asked Ambrosia if she could find her a bear who was brown and blue, and who was holding blue lilies. So Ambrosia went out in to the flowery garden, took a piece of sky, a bit of earth, and made a bear. The sun shone an dsome lovely lilies began to grow from the bear's hand. The bear was so happy that she began to sing just like a bird, and so Ambrosia named her Jay! 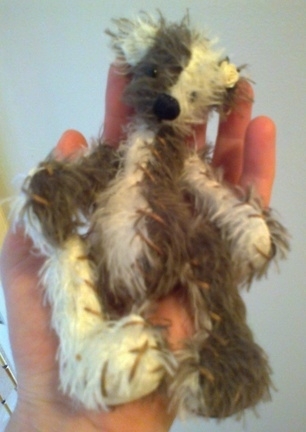 A little while back, Sandra asked Ambrosia if she could find a teddy version of her gorgeous dog, Bailey. So Ambrosia went out in to the magical flowery garden and found a lovely snuggle dog! He even has a tiny white goatie, just like the original Bailey! 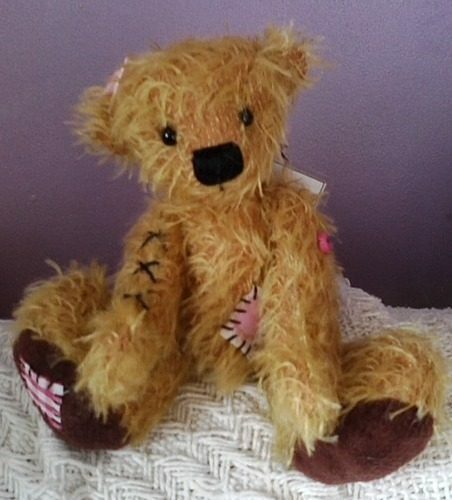 And Ambrosia is now very proud to announce an Ambrosia Bears first! We have twins! 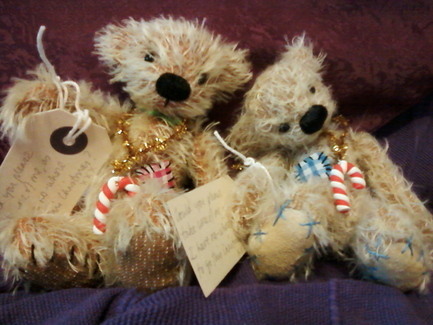 Holly asked for a little baby bear to be made, and we ended up with two, because they are just so sweet! Little Patch, on the left with his cap, necklace and box of toys, is going to stay with Holly and her lovely collection of other Ambrosia Bears, whilst Sweetheart, on the right, will be staying with Ambrosia. Holly just loves the Baby Bear pattern, and she came up with a fantastic idea: a bear with coloured eyes! Holly has named her beautiful bear Crystal. I bet she will love living with the rest of the Ambrosia Bears at Holly's house! And we have yet another set of gorgeous twins! Lord Tudbury and Lord Chatterley are proud to make their appearance! It's quite amazing how the same pattern can end up with bears who become very individual. And we seem to be having a lot of requests for twins at the moment! The gorgeous Emily-Rose - along with her musical box - and the handsome Peppermint are very glad that they could stay together! And then Ambrosia was asked to make a puppy; she'd never done anything like this before and so had to make the pattern and everything from scratch! The lady described what she'd like and Tobias was the result! He's even wearing a real puppy collar. Isn't he gorgeous? And then someone else wanted a little replica made of their Yorkshire terrier, Jasper! She sent over the material and said what she'd like and here he is. What a sweetheart! And then the lady who commissioned Tobias asked for a replica to be made of her German Shepherd, Jack, when he was a fluffy, chubby puppy. The bears wanted to to keep him! They bought him a toy and a real puppy bed all ready for his new home. And then there was call for a Numpty in grey mohair! Daisy is going to live in Lisbon in Portugal; how exciting for her! And a rather sad case with a happy ending. Someone commissioned a little panda and, when Ambrosia was half way through creating him, they changed their mind and no longer wanted him. How lucky for little Chi because he was able to stay permanently at Ambrosia Place with the other bears! And then there was call for another black puppy in a dog bed. This one, made from mohair - he also has glass eyes and a glass nose - looks really cheeky! Everyone seems to want a puppy! Someone asked for a grey, wolf cub and here he is, all fluffy and ready for a cuddle! He even has glass blue eyes and a little glass nose. And finally time for a bear! Jelly Tot is made from string mohair and she is filled with buckwheat scented with Nag Champa. Isn't she gorgeous? Then someone wanted a colourful stegosaurus! This was a real first for Ambrosia and she enjoyed every minute of making Bernard! And then another little bear was called for. Isn't he sweet? And then a bear for a new baby! And another, more traditional teddy! And, perhaps the most spectacular of all, a little sloth appeared! The commissions seem to becoming increasingly exotic, so it was marvellous when someone asked for an anteater! And then someone asked for a Baby Bear. He looks like a little lion, and a bit cross, doesn't he? And then someone asked for a really traditional teddy. Isn't he lovely?